Why did all the Pandavas (i.e. 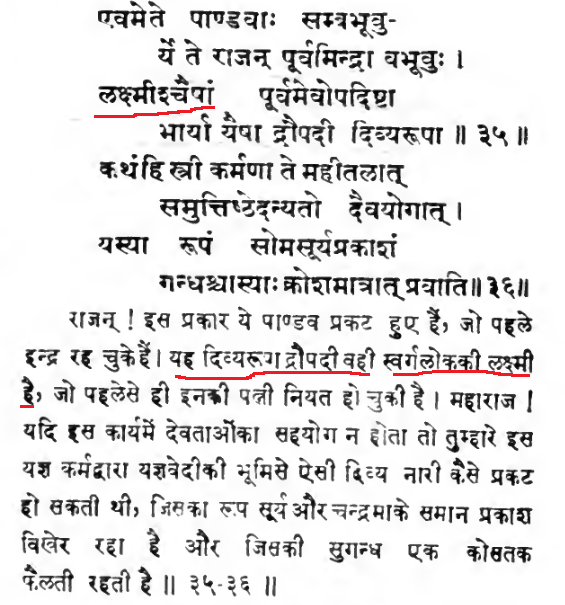 Yudhisthira, Bhima, Arjuna, Nakula and Sahadeva) marry the same woman i.e., Draupadi? What was the circumstance under which they had to marry Draupadi? [After returning from Swayamvar,] Arjuna childishly addressed his mother first "look mother, what we have brought." Assuming it was simply alms, Kunti un-mindfully and unassumingly asked her son to share whatever it is with his brothers. Thus, in order to obey his mother's order (either on general principle or because of Arjuna's aforementioned vow), all five accepted Draupadi as their wife. [Draupadi didn't agree with this decision, so Krishna (Vyasa in some stories)] explained to Draupadi that her unique position as the wife of five brothers resulted from her previous birth. She was born as Nalayani. She had in that lifetime prayed to Shiva to grant her a husband with fourteen desired qualities. Shiva, pleased with her devotion, told her that no man possessed all fourteen qualities. But she was resolute in her wish. Then Lord Shiva grants her wish saying that she would get the same in her next birth with five husbands; she was shocked and asked lord Shiva if it was a boon or curse. Shiva replied back saying "My child do not get worried, you will regain your virginity each and every morning you take bath, till the end of your life you will live with virginity." You need help of other Puranas and shastras to understand a particular complex seeming situation in one itihaasa or one purana. In Sanskrit its called DHARMA-SOOKSHMA meaning minute observation. People who don't understand Sanskrit read Mahabharata in other languages and those film and serial makers , not knowing the dharma-sookshma make films/serials which people think are right. And we Hindus get questions thrown at us just out of the derogatory intention that Hindu scriptures are ridiculous. Please read authentic books recommended by scholars before questioning. I see that many Hindus themselves don't know what a dharma-sookshma is and how is it dealt with by great people. All the 5 Pandavas are different forms of the one Lord Indra. Sachi is the wife of Indra. Sachi is called svarga-devata or the Shakti of Indra. (in Hindu texts related to Gods, Wife is not to be understood as in case of a human being, instead it should be understood as the God's inherent Power or Shakti). Sachi is born as Draupadi and so the Indra divides his energy into 5 forms. Also interestingly , if u read the original Mahabharata, there was a very big discussion / conference held by sage vyasa with eminent people of that kingdom for a couple of days who are answerable to the subjects of that kingdom, before agreeing to the Draupadi's marriage. Vyasa has such a foresight that he expected that people of kali yuga would have such questions. Vyasa then with the power of his penance shows the people in that conference the real identities of all the 5 Pandavas as one Indra energy. So, there is no awkwardness in Draupadi marrying 5 Pandavas. O king, they who have been born as the Pandavas are none else than those Indras of old. And the celestial Sri herself who had been appointed as their wife is this Draupadi of extraordinary beauty. How Draupadi is a pathivrata? Draupadi was also avatar of Goddess Shree or Wealth who was joint wife to five Indras, the Five Pandavas. She was to be born several times for imprisoning the Indras. First time was as Vedavati who cursed Ravana (who is another goddess Avatar Swaha, wife to Agni). She then came again as Maya-Sita especially to take revenge from Ravana while Agni hid the real Sita. Third one was partial either Damyanti (whose husband Nala was equivalent to Dharma, Vayu, Indra just like the Pandavas) and her daughter Nalayani. She married Sage Mudgala. The fifth avatar was Draupadi herself. So we find in Draupadi, a composite avatar of Kali, Parvati, Sachi, Shyamala, Usha, Bharati, Shree, Swaha, the eight goddesses. At Pandavas residence Lord Krishna took Draupadi aside and said, "This awkward situation you find yourself in is of your own making. In your previous birth you had pleased Lord Shiva with your prayers. He granted a boon to you. You said that you wanted a husband and to ensure that your request was heard, you repeated it five times in all. Shiva then said that in your next life you would have five husbands." Some sources have a slightly different narration. Draupadi made her request only once but she added a long list of qualities that she wanted in her husband. Shiva said that it would be impossible to find one man with all these qualities. Hence she would have five husbands in her next life. All of them together would posses the qualities she had enumerated. Lord Krishna said ," You will spend one year with each husband. Others will be forbidden to enter the chamber in which you and the husband-of-the-year are staying. If one does so, even accidentally, he would be exiled for one year." Fraternal Polyandry in Mahabharata,The Reasoning? How could Pandavas marry Draupadi, who is their stepmother's rebirth? Which words are used by Pandavas to address Dhritarashtra and Gandhari?